Iceland may not be the obvious family vacation choice, but it should be. Known as the "land of fire and ice,” Iceland's breathtaking scenery is largely due to the fact that it is one of the most volcanically active areas on earth. You will see this activity first-hand as you drive along its southern coastline which showcases a constantly changing geography of flat farmlands, mountains, fields of moss-covered lava rocks, black sand beaches, and steaming geothermal pools. You’ll find towering waterfalls at every turn, small villages offering basic amenities, and kind and friendly people. As you venture further east along the southern coast, your children will be in awe in the presence of giant glaciers and icebergs bobbing in the ocean. It's your very own geological exhibition. As you leave the charming and colorful town of Reykjavik driving east along the Ring Road, you leave behind the traffic and have an open road (and spectacular scenery) ahead of you. Your journey along the southern coastline will be one Instagram-worthy photo after another. Iceland itself is about the size of the state of New York but with about 19 million less people. The population of Iceland checks in around 337,000, and about 60% of those live in or near the capital city of Reykjavik. So once you get outside of the capital, you'll have plenty of elbow room to explore. With almost 80% of the country uninhabited, it feels remote without feeling desolate. Along your way around the Ring Road, you'll encounter small villages offering basic amenities of food, gas, and lodging. 11% of Iceland's landmass is covered by glaciers. You can see these large glaciers from miles away, and you can walk to many of them or even hire a guide to walk on them. Iceland's breathtaking scenery is largely due to the fact that it is one of the most volcanically active areas on earth. You will witness this activity first-hand as you hike to the top of a volcano in the Westman Islands. You’ll drive by fields of moss-covered lava rocks, steaming geothermal pools, and even geysers. It's your very own geological exhibition. Iceland’s glacier lagoons are perhaps one of the most memorable sights in Iceland. The serene lagoons are filled with floating icebergs and swimming seals. Icebergs floating in Jökulsárlón Glacier Lagoon, just off the Ring Road. You can watch icebergs tumble in the surf while walking a black sand beach glittering with icy remnants of a nearby glacier. Jökulsárlón Beach also known as "Diamond Beach"
You'll find no shortage of walks and hikes leading you even closer to Iceland's amazing natural wonders. You can walk 5-15 minutes or hike an epic 15 miler. Your choice. As you proceed along the Ring Road, you will lose track of the sheer number of beautiful waterfalls cascading down the mountainous cliff faces. Many of these waterfalls are easily accessible, allowing visitors to walk above or even behind them. Throw in the occasional rainbow and it doesn't get much better. The tap water is pure, and the air is clean. Though pricey, the food is simple but tasty-- expect fish, lamb, hearty soups, delicious bread, good beer, and the best yogurt you've ever had. We loved the fish soup at Kaffivaginn in Reykjavik, the fish and chips at the food truck near Skógar, and the beer from Brothers Brewery in Vestmannaeyjar (the Westman Islands). You'll find most signage and menus in English, making language translation practically unnecessary. Which is a good thing, because the Icelandic language to an English speaker looks like someone created words by typing random letters on their keyboard. Loved their New England style IPA! Iceland is also super easy to navigate with one main road (Route 1, also known as the Ring Road) circling the island. We thought we might have difficulty as "it is just off the Ring Road" is a common direction given for places in Iceland. But they are not kidding, the Ring Road is the only major road outside of Reykyavik and you will not have problems finding your way. The sun essentially never sets during the summer, leaving you with plenty of daylight to acclimate and have fun. Close the blinds at night and fall in to bed after a day of exploring. Our goal is to help simplify your trip planning by sharing all the details you need for an enjoyable family vacation. 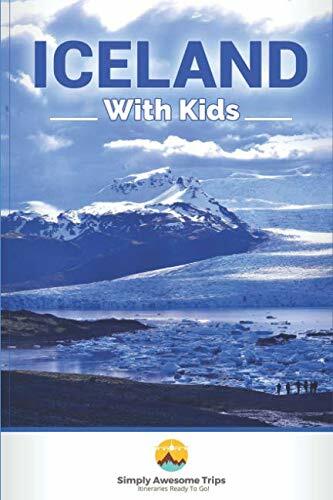 Iceland With Kids offers a day-by-day itinerary with driving times, the best stops and sights to visit in Reykjavik and along Iceland’s southern coast, easy hikes, recommended lodging (hotels and guest houses), and dining options. At the founding of Simply Awesome Trips, we agreed to travel as we always have with our families—on our own dime. No free nights, no comped visits, not even any swag. We continue to feel good about that decision. We do participate in affiliate marketing with some of the companies that we personally use (Booking.com, VRBO.com). They don’t pay us to write, we simply get a commission if you enter those sites through our “gate” as opposed to say a Google search. But we also recommend lodging, restaurants, and activities, where we don’t receive any commission, such as Airbnb or private rental companies. We don’t change recommendations based on vendor. If it’s good; it’s good. Jaguars and Toucans and Tapirs, Oh My! The Belize Zoo Rocks. Thinking About Visiting the Great Barrier Reef? Look at Staying on Hamilton Island.